We can help you find a expert hydroseeding contractor in your local area. We can help you find an expert hydroseeding contractor. Have an erosion control project? Our list includes experts that can do it for you. We have experts who would be happy to hydroseed your project. Our site is designed to help people find trained hydro seeding contractors who are experts in seeding new lawns, in erosion control work and site stabilization. We have tried to build the “The World’s Largest List of Hydro Seeding Contractors”. We can help you find a factory trained hydro seeding expert in your local area. This list is frequently updated. For those wanting to learn if hydroseeding is a good option for their project we also have lots of information about the hydroseeding process and how it works. Hydroseeding is a one step process and can be the fastest way to creating a lush green lawn. It is also a great way of planting wild flowers, crown vetch, native grasses, for soil stabilization projects, re-vegetation, erosion control and lots more. The hydroseeding process involves spraying on a mixture of water, a high quality grass seed, hydroseeding mulch which protects the seed and helps keep the seed moist to promote fast germination, a high quality starter fertilizer that feeds the new seedlings and promotes a strong root system, and a tackifier which works like a glue to help hold the material in place in the event of heavy rains. Hydro seeding typically will produce great results faster than other methods of establishing a new lawn. Feel free to visit the advantages page to see how it compares to other seeding methods and why sod quality results can be achieved at a fraction of the cost. No matter how well hydroseeding is applied it needs moisture to grow. Taking proper care of a newly hydroseeded lawn can make a big difference in the results. Mother nature may provide the necessary moisture but in hot or dry times care of the newly seeded lawn can help assure you have a stunning lawn your neighbors will admire. Please visit our “Care” page to learn more about how you can help create that stunning lawn. Turbo Turf Hydroseeding Systems have been manufactured by Turbo Technologies since 1990. Turbo Turf HydroSeeding Systems are available with either jet agitation or mechanical (paddle agitation). 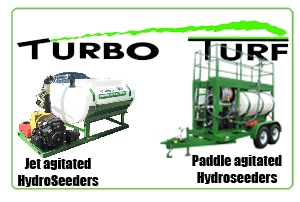 Jet agitated hydroseeders are available in sizes from 50 gallons to 1600 gallons and paddle agitated units are available in 400, 500, 750 and 1000 gallon sizes. Turbo Turf’s mechanically agitated units have long life poly tanks that can never rust and are far easier and faster to clean at the end of the day. HydroSeedingExperts.com was created in 1998 by Turbo Technologies as a benefit to those hydroseeders using Turbo Turf’s machines and when the International Association of Hydroseeding professionals was formed in 2004 a partnership was established that allowed IAHP members to have a premium listing on the site.